I love to read! I love all kinds of genres, I love the library, I love to buy books, I love used bookstores, I love my kindle… if I met any of my favorite authors, I would fan-girl all. the. way! 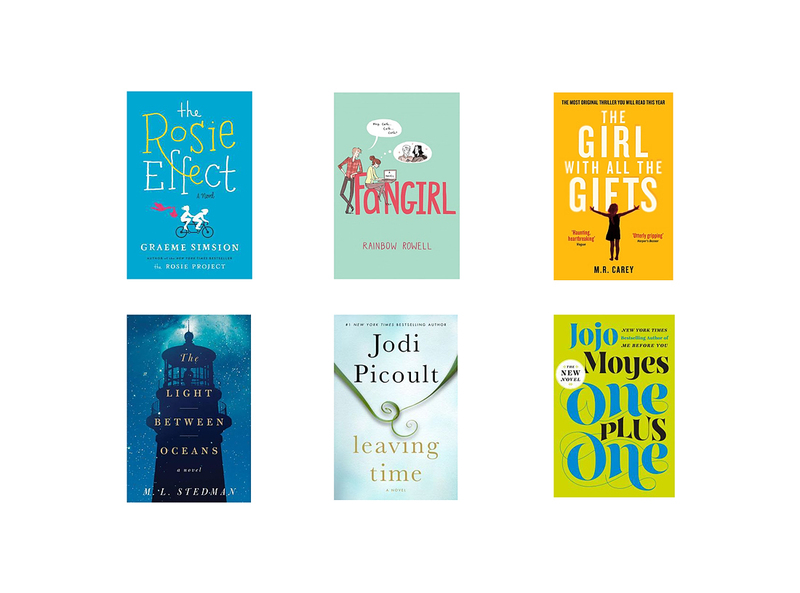 So… I thought that I would share some of the books I’ve been loving over the last few months. I know I love reading these types of blog posts…do you? Fangirl by Rainbow Rowell: I have been on a young adult fiction kick! This is the fourth book that I’ve read by this author. I enjoyed Eleanor and Park, Attachments, and Landline as well. For me these books are just fun, easy, purely entertainment (no thinking needed), and a stress-reliever. The Girl With All The Gifts by M.R. Carey: This book was so not what I was expecting, but I loved it. You definitely fall in love with the main character, even though technically, you’re not supposed to… Walking Dead fans, anyone? The Light Between Oceans by M. L. Stedman: Loved this book about a lighthouse keeper and his wife. I definitely know what it feels like to want a baby so bad, to be a mother so bad, that you forget yourself…just a friendly warning: you will need tissues. Leaving Time by Jodi Picoult: Jodi Picoult is one of my favorite authors, and I preorder her books as soon as she writes another one. This book is about a young girl who never looses hope that she’ll be able to find the truth about her mother, who disappeared when she was really little. Loved the newest release by J.P. …two things: elephants, who knew? and surprise! One Plus One by Jojo Moyes: I have been obsessed with this author ever since I read Me Before You almost 2 years ago. This story follows Jess, the struggles of a single parent, and second chances. Those are the books that I’ve been loving. I have Big Little Lies by Liane Moriarty lined up on my kindle. What are you reading? Any favorites?